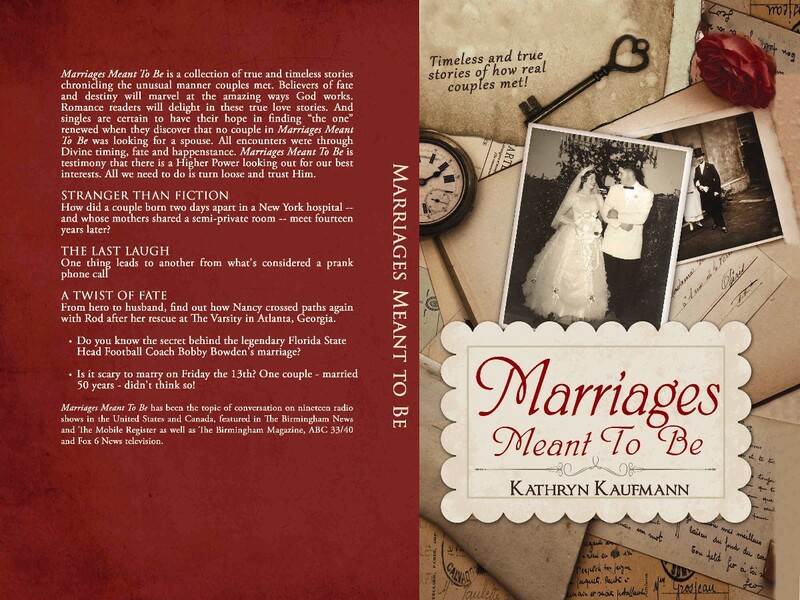 Marriages Meant to Be is a collection of true and timeless stories chronicling the unusual manner couples met. Believers of fate and destiny will marvel at the amazing ways God works. Romance readers will delight in these true love stories. And singles are certain to have their hope in finding “the one” renewed when they discover that not one couple was looking for a spouse. All encounters were through Divine timing, fate and happenstance. The stories are testimonials that there is a Higher Power looking out for our best interests. All we need to do is turn loose and trust Him. INCLUDES FREE SHIPPING and A FREE GIFT!! A 43-year-old professional woman on the verge of giving up on love writes down the characteristics of her perfect mate and meets him exactly one year later. One thing leads to another from what's considered a prank phone call. From hero to husband, find out how Nancy crossed paths again with Rod after her rescue at The Varsity in Atlanta, Georgia. Marriages Meant to Be has been the topic of conversation on nineteen radio shows in the United States and Canada, featured in The Birmingham News and The Mobile Register as well as The Birmingham Magazine, ABC 33/40 and Fox 6 News television.